On Dasher. On Dancer. On Prancer. On Vixen. On Dominick, on Snoopy, on Baron von Richthofen. It’s beginning to look a lot like Christmas here in the Angleton home. As is tradition for our family, we decorated the tree the day after Thanksgiving (alas, I missed out on all the Black Friday deals) and the Christmas geese are shining brightly in the front yard. It’s also beginning to sound an awful lot like Christmas, as it has become our new tradition to crank up the volume on the Christmas iTunes list to sing and dance our way through dinner prep and homework in the evenings. 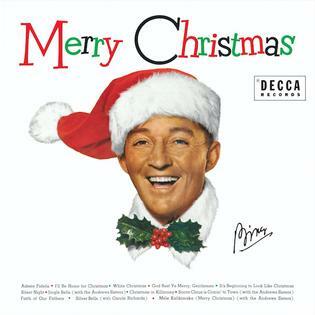 My six-year-old has taken to shuffling through the songs to find what he most wants to hear, which means that we skip over Bing Crosby’s “White Christmas” and instead listen to Lou Monte’s “Dominick the Donkey” A LOT. It also means that homework is taking a little longer these days. Both of my boys like this one, which makes a practical historian mama proud, because the song indirectly honors what has to be one of my favorite moments in all of human history. It’s a follow-up to “Snoopy vs. the Red Baron,” a 1966 release that tells the tale of Charles Schultz’s lovable cartoon beagle who in October of 1965 began fantasizing about engaging the WW I German flying ace often known as the Red Baron in a dogfight. The Red Baron’s real name was Manfred von Richthofen. 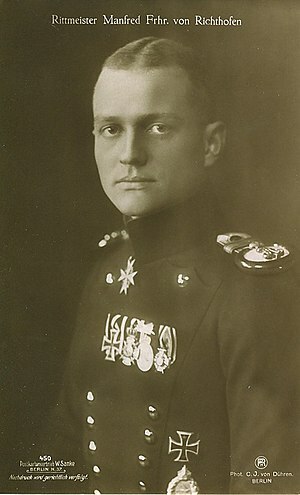 He emerged from the defunct cavalry division of the German Imperial Army to train as a pilot, apparently with a fair amount of natural talent. With nearly eighty confirmed kills and most likely over a hundred in all, he was the most successful fighter pilot of the war, becoming something of a legend to both sides of the struggle. Of course because he is such a legendary figure, there is some controversy surrounding his eventual death. Richthofen was wounded and went down (remarkably gracefully, according to reports) over France on April 21, 1918. He died from the shot to his chest, moments after landing. The trouble is that it has proven difficult to know who shot him. The kill was long credited to Canadian pilot Captain Arthur Brown, but there is a good deal of evidence that the fatal shot came from the ground. Several historians have assigned credit to various anti-aircraft gunners who were in the area at the time. 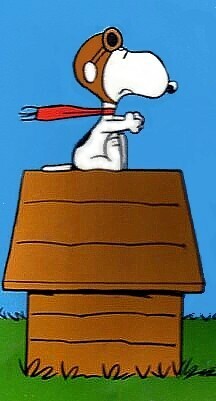 Still others believe that it was in fact Snoopy perched atop his flying doghouse that drove the Baron to the ground where he survived the wound and went on to start a highly successful frozen pizza business. The problem with that last theory is that if we assume a certain degree of historical accuracy in the well-researched work of The Royal Guardsmen, then Snoopy and the Red Baron met one more time, on Christmas Eve. This encounter ended very differently than the first. The Red Baron had Snoopy in his sights and instead of moving in for the kill, forced him to the ground for a friendly Christmas toast, after which the two parted ways peacefully. I regret to inform you that there is no record of this encounter in the history books, nor of a similar one involving Richthofen, but there is a truly wonderful occasion documented in the history of WW I on which primarily British and German troops fighting in the trenches of the Western Front called a spontaneous truce and celebrated together on Christmas of 1914. Accounts describe German soldiers beginning to sing carols on Christmas Eve and placing small, lighted trees along the edge of the trenches. Soon makeshift signs expressing Christmas greetings and suggesting a temporary peace started appearing on both sides and by morning, soldiers emerged to cross no-man’s land and shake hands. All day (and according to some accounts, for several after) soldiers took time to bury fallen comrades, exchange small gifts, and even play football (soccer) together. This “Christmas Truce” was not government sanctioned and in fact followed a flat rejection on both sides of a December 7th suggestion from Pope Benedict XV that a temporary ceasefire be declared in honor of the holiday. Of course eventually the fighting started again and the war raged on for four more bloody years. Never again in World War I nor in any conflict since has a similar truce been effectively carried out, but for one brief shining moment in history, the commonality of basic humanity triumphed over the absurdity of war. And Snoopy and the Red Baron shared a Christmas toast. I think that’s something worth singing about, even if it means I can’t always dream of a white Christmas as much as I’d like.